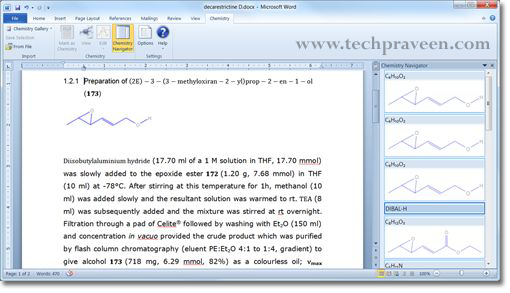 Microsoft has made available for download a free Chemistry add-in for the 2010 and 2007 flavors.Empowering students, teachers and chemists to easily author documents in the language of chemistry is at the heart of the Chemistry Add-in for Word. Every discipline has its own language. And being able to communicate and collaborate in a discipline-specific language is essential to scientific research, especially in an environment characterized by staggering volumes of data. In chemistry, not only is there a specific language, but a specific language with specific symbols and conventions. 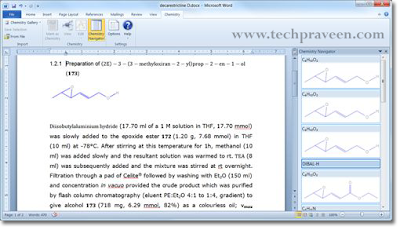 By giving these symbols meaning, the Chemistry Add-in for Word is also enabling chemistry documents to easily convey this meaning across technologies and file formats.The Chemistry Add-in for Word was developed to be a tool for writing and rendering semantically rich chemistry information in Microsoft Word documents. Although the Chemistry Add-in for Word is essentially designed to integrate seamlessly with both 2010 and 2007 flavors of Office Word, the software giant noted that early adopters running the Beta development milestone of Word 2010 wouldn’t be able to leverage it. According to Wade, Microsoft plans to make the add-in available as an open-source project via CodePlex. The company indicated that the project would be published under an Apache license by the end of 2010.